Bernard Symes was born about 1847 in Shepton Mallett, the son of William and Matilda Symes. 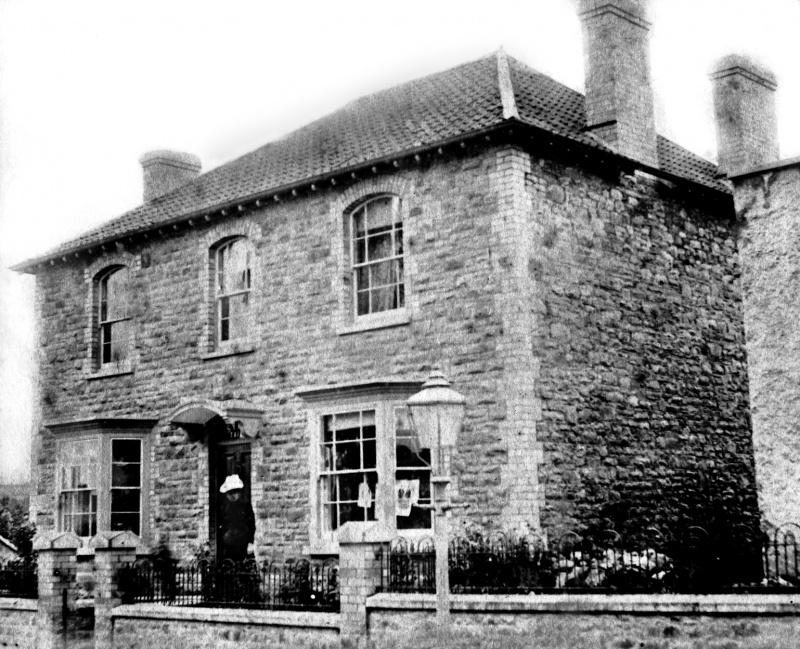 Bernard moved with them to Thornbury between 1852 and 1856 and in 1861 he was living in their house in ‘Pullins Green’. On the 31st December 1870, Bernard married Laura Putley. Laura, the daughter of John Putley, was born in Thornbury about 1843. In 1871 Bernard and Laura were living at Gillingstool. Bernard was a tailor. In 1881 they were still in the same house, but now had three children living with them: George Bernard born in 1872, Laura Elizabeth born on 15th September 1873, and Annie born in 1876. Their other daughter, Charlotte Matilda, born in 1875, was staying with her grandmother, Martha Putley at Grovesend Slade. The photograph on the right shows the whole family in the early 1880s. We believe that the family were initially living at the house which later became known as Gillingstool Cottage. The owner of that house was Hannah Dyer with whom Bernard and Laura had been living. When Hannah died in 1885, she left all her property to Laura Symes. We haven’t been able to establish the relationship between Hannah and Laura. However, this inheritance seems to have prompted Bernard to arrange for a larger house to be built in the garden of Gillingstool Cottage, between it and the school. In 1891 the family were living in the new house which was called Jubilee House. Their three daughters were still living with them. Elizabeth was a draper’s assistant, Matilda was a teacher and Annie was still at school. Their son, George Bernard, was boarding in Boyson Road, Newington, London where he was training as a tailor’s cutter. Bernard died in 1892 and was buried in the churchyard at Thornbury St Mary’s Church on January 15th at the age of 43. Laura continued to live in Jubilee House until at least 1895. The roll of what is now known as the United Reformed Church shows that Mrs B Symes was unable to attend through “much weakness and home care”. We have seen a record of a ‘claim to vote’ by Bernard and Laura’s son, George Bernard Symes which shows George as a lodger paying his mother a rent of 7 shillings and six pence per week for furnished showroom, workroom and bedroom. The record shows that George declared himself as a Liberal and he was allowed to vote. The 1899 rate book and the 1901 census shows Laura living at 50 High Street with daughter, Annie. She was still listed as living there in the 1905 rate book, but in the 1910 rate book her name was crossed through. Laura died in 1911 and is buried in the same grave as Bernard. In late 2006 we were shown a collection of photos including one of an un-identified house. At first we thought this was the house belonging to the Pitcher family in Gloucester Road. However on closer inspection we noticed some differences between the two houses and saw that on the glass panel above the front door was a name which appeared to be ‘Symes’. Further research proved that it was indeed a photo of Jubilee House which had been the family home of Bernard Symes for many years. Please click on the photograph on the left. Laura Elizabeth Symes was born in 1873. She was known by her middle name. On September 29th 1898, she married Arthur Hewlett Wilkins, a draper in the High Street and they had three daughters, Constance Mary born in 1899, Mildred Laura born in 1901 and Margaret Alice born in 1903. Arthur had a draper’s shop in the High Street, opposite the old fire station. He was a volunteer fireman for many years and became Captain of the Thornbury Fire Brigade. Elizabeth died in 1945 aged 71 years and Arthur died in 1949 aged 77 years. Charlotte Matilda Symes was born in 1875. She became known as Lottie in the family. Charlotte attended the British School and the school log book for May 1885 reports that Charlotte was one of the ten children awarded a scholarship by the governors of Thornbury Grammar School.